Over the summer holiday’s, a friend of mine went on a day trip to Paris. Now at first, my mate did not like his time at this lo-cal one little bit. The currency was strange. The weather was damp. And by enlarge, French people populate it as well. Still, over time my friend began to like it over there. Just like the Director: Steve Bendelack; and the Actors: Rowan Atkinson and Willem Dafoe. Especially for 86 minutes in 2007. Now you would have thought that when the clownish simpleton, Mr. Bean (Rowan Atkinson), wins a trip to the Cannes film festival in a church raffle, that this would be a good thing for him, right? But no. Not really. Due to a misunderstanding he has at the Gare du Nord railway station in Paris, things do not really turn out too well for Mr Bean in the way that he would have hoped for. Nobody understands him. He hates the food. And worst of all, when Mr Bean eventually embarks on the train to take him to Cannes, he befriends a Russian film critic called Emil Dachevsky (Karel Roden), and by mishap and misfortune, leaves him stranded on the platform, whilst his son, Stepan Dachevsky (Max Baldry), rides with him on the train. Obviously feeling that this unfortunate turn of events is his fault, Mr. Bean tries then his best to get Stepan back to his father any which way he can. He tries to call him on the phone – but he cannot, as he has lost his money on the platform. He tries to ride the train with Stepan to where his father said he would be, Cannes – but again, he cannot, as he has lost his ticket as well. Furthermore, he even tries to dupe his way into earning some funds, so that he and Stepans can buy bus tickets to get to Stepans father also. Granted, to some extent, his latter venture does work out for the best. Yet, in so doing, Mr Bean does lose his bus tickets to a chicken, as well as Stepan in the process. So what does Mr Bean do with himself now, huh? Steal a motorised bike? Gets stuck in a wooden shed? Before causing calamity on the film set of the famed film director, Carson Clay (Willem Dafoe)? Yeah. He does. Still, what goes up, must come down. And, by chance, Mr Bean meets actress, Sabine (Emma de Caunes), whilst she is driving her car (a mini), and she offers him a lift to Cannes. Also, as luck would have it, they bump into Stepan too, and they go together, as one happy trio, driving there way to Cannes for as long as they can keep their eyes open. But wait! The media accuses both Mr Bean and Sabine for kidnapping Stepan, thus causing whatever to transpire next to be a somewhat arduous affair indeed. 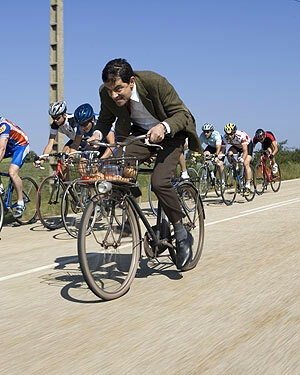 As masquerades are made – movies are played – reunions are displayed – but ultimately, Mr Bean has a video recording that has to be relayed. Believe it or not, I saw the first ever showing of Mr Bean way back in the day on London Weekend Television. And, to be honest with you, I did not really like it at all. You see, at the time, I was used to seeing Rowan Atkinson play the part of the sitcom star -- ‘Blackadder’ -- and I really liked the way he said and done things on that show. He seemed confident in his poise. His diction was lyrical to the ear. Moreover, ‘Blackadder’ was just one funny slice of silliness. So as you might have guessed, when I first saw Rowan play ‘Mr Bean’ on TV, I thought to myself “What the f*ck is that all about then?” (or words to that effect), and I could not seem to see it for what it truly was -- a farcical and cartoonish homage to the silent era of comedy. Granted, my perspective nowadays has changed greatly, and I feel that Mr Bean is one of the only characters out today, who has bridged the gap between the ‘old school’ style of comedy, to the new more ‘subversive’ kind. However, do I feel the same way about this film? Err... yes and no I suppose. Listen now, please do not get me wrong when I say this -- it is what it is -- a farcical adventure with a pithy and poignant undertone. Still, at the same time, I would have liked it to have seen a more well defined pretext, as well as a less meandering plot-line. 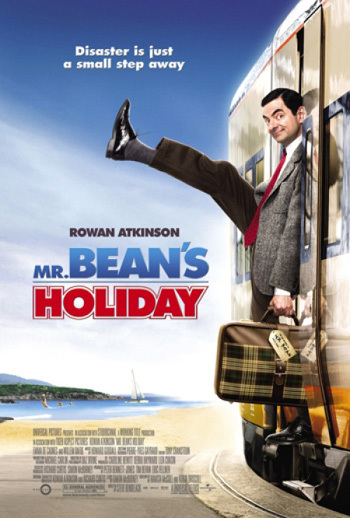 In essence, ‘Mr Bean’s Holiday’ is a fun and jovial tale for all the family, and is uplifting in its approach and funny in it's style. Also, I would like to say that it balances a number of elements that work in a way that films such as these do not normally adder to. For example, the sub-plot about the egotistical film director really does punch home by the end of the movie -- even though it was rather fleeting overall. Next, I would have to say that the skit like narrative of this film does seem to flow in a very nice manner -- even if it does meander in places. And finally, the complete package is greatly enhanced by the music -- which does elevate certain key elements far more than I thought they would. Oh! And lets not forgets the actors, huh? In roll call fashion: Karel is intense. Max is sublime. Willem is a star. Emma is just loveable and I want to give her a baby. And as for Rowan -- well -- nothing I say can describe how I feel about this great man (which is appropriate I suppose). Now to finish of this review, let me bore you senseless with some facts, OK? (1) Rowan Atkinson got the voice for Mr. Bean whilst he was on stage during an Amnesty International performance, trying to imitate sixties comedian, Dudley Moore. (2) Mr. Bean was devised when Rowan was studying for his MSc at Oxford University. (3) Mr Bean was originally called Mr Cauliflower -- as well as other vegetables also. (4) Mr. Bean's earliest appearances occurred at the 1987 "Just For Laughs" comedy festival in Montreal, Canada. And (5) A similar character called ‘Robert Box’ was played by Rowan at the Edinburgh Fringe in the early 1980s, and also appeared in the one-off 1979 ITV sitcom ‘Canned Laughter’, which featured routines utilised in the 1997 ‘Bean’ film. Overall, ‘Mr Beans Holiday’ is just so uplifting, that it makes you want to go over to France, and bang a frenchy -- in a good way of course.